There are multiple unloading facilities as well as handicapped facilities for our members and visitors. 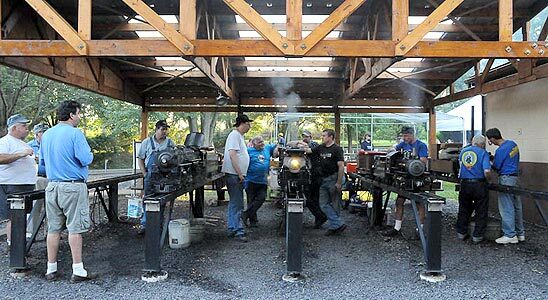 There are 13 multi-gauge steaming bays in the turntable pit area with water, electricity, and air, 10 bays in front of the locomotive storage building, and a yard of substantial size for building your train. Our new car storage barn has been in operation since 2006. 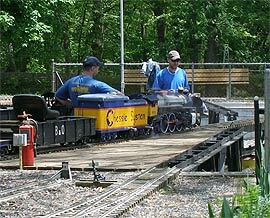 The 18’ by 72’ building is located north of the engine storage facility and contains 15 tracks of 7¼" gauge on two levels. 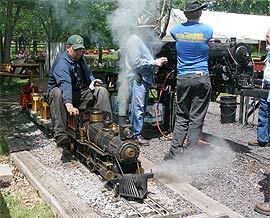 The Pennsylvania Live Steamers maintain a 5 acre club site with 3,200 feet of 1½" scale (7¼" gauge), 3,000 feet of 1" scale (4¾" gauge), an 800-foot multi-gauge loop and a 219-foot dual-tracked Gauge 1 loop. In modeling terms, scale refers to the ratio of the size of the model to the full-sized object (e.g. 1½" to 12" or 1:8) while gauge refers to the distance between the heads of the two running rails. At our Spring and Fall meets we offer very limited camp sites to our Live Steam visitors on a first-come, first-served basis. Unfortunately, we cannot offer hook-ups of any kind. If you just want to watch, we have picnic tables in the shade at strategic locations for your convenience. Benches are located over much of the property. There are portapots available on all run days, a newly purchased (state of the art) soda machine offering 11 types of cold drinks and spring water. Most areas are handicapped accessible with handicapped parking available.